To the west of the Pacific Highway from Byron Bay, in the rural foothills of the Nighcap Mountain Range, lies Myocum. A tapestry of fields fills the valley interspersed with small pockets of housing nestled on hillsides and along peaceful back roads. Little but the sounds of nature can be heard and properties extend freely into their expansive surroundings. Myocum evokes a sense of freedom from the distractions of commerce and a hemmed in suburban township, while still offering easy access to all modern conveniences and services. 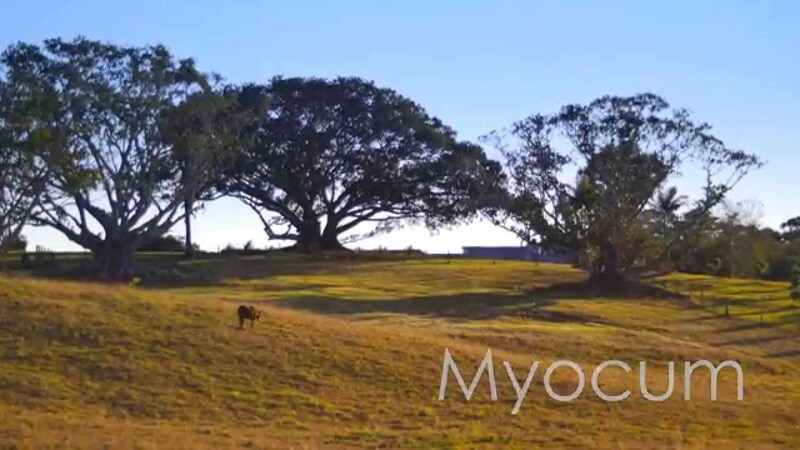 Mullumbimby, Byron Bay and Brunswick Heads are all just a short drive away, servicing Myocum with all amenities, entertainment, restaurants, live music and glorious beaches. An artist’s paradise, the expansive landscape and utter tranquillity offer peace and inspiration for the creative mind. Myocum allows you solitude without isolation. From the timber balcony of the many modern weatherboard properties, not a single trace of development may be seen, but within 10 minutes you’ll find yourself in the thriving hub of Byron Bay, watching a band play and Mullumbimby’s Middle Pub or lounging on the uncrowded beaches of Brunswick Heads. Myocum allows rural peace with the convenience of a more suburban location.